A very big heartful thank you to all my friends for sharing incredible and luminous recipes that you gals/guys love to cook to your lovely ones. Dish For Loved Ones received a very huge assortment of 197 entries. I am overwhelmed by visiting all these scrumptious recipes!!! Awesome !! 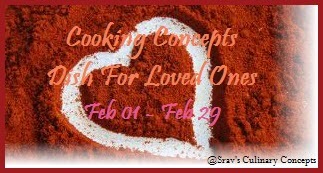 Presenting the roundup of marvelous and appealing recipes for your loved ones. Wow!All of them look mouth-watering. Great event! That's one incredible roundup Sravani! A lovely display of lovingly-prepared recipes! Wonderful collections are here, lovely roundup.